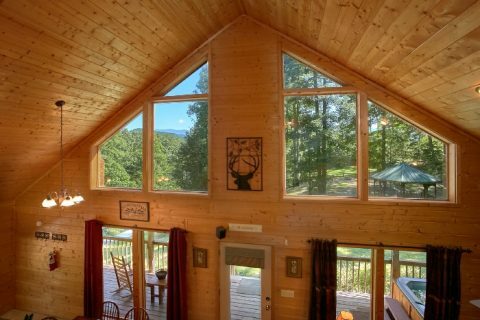 You'll love staying at "Sweet Seclusion" in Richardson Cove in the Great Smoky Mountains of Tennessee! 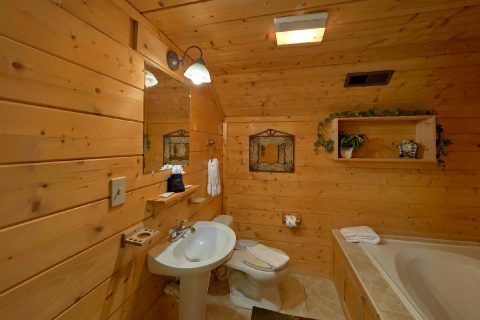 For a great nightly rate, you can enjoy privacy in a peaceful part of the Smokies with fantastic cabin amenities. 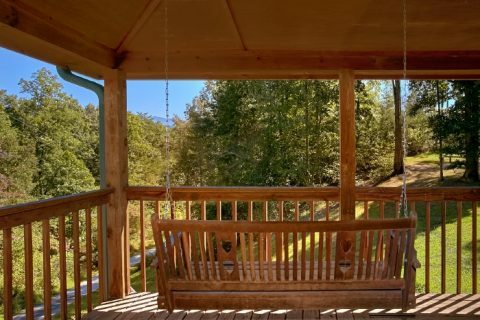 From your beautiful hideaway in the mountains, you can easily reach terrific attractions like Dollywood, the Dixie Stampede Dinner Show, and several entrances to the Great Smoky Mountains National Park. 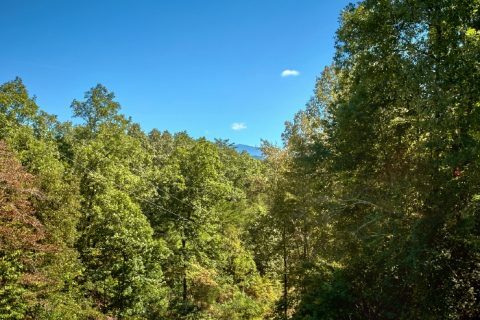 Since Richardson Cove is close to Upper Middle Creek Rd, you'll enjoy quick access to Dollywood and the Pigeon Forge Parkway. 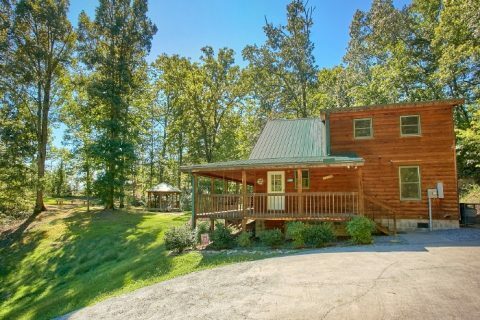 By driving to Pittman Center, guests of this cabin can reach Gatlinburg and the national park by way of scenic country roads. 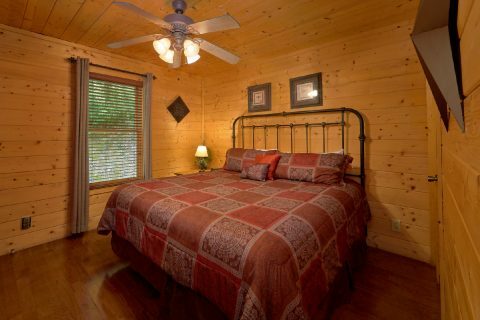 When you aren't out exploring the Smoky Mountains, you can take it easy at your comfortable cabin with room 6 guests. 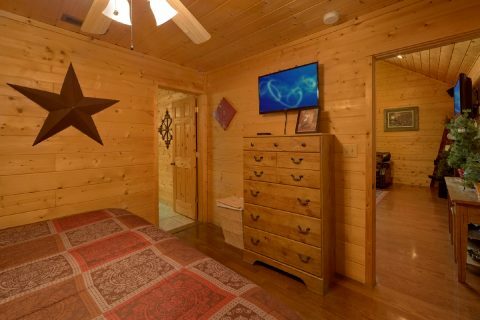 Whether you're planning a family vacation or a romantic getaway with someone special, you'll enjoy all the benefits of this premium cabin in Pigeon Forge. 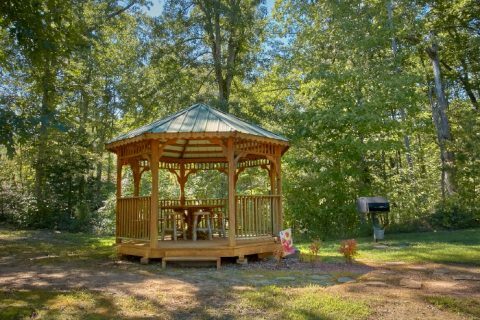 When you arrive at your vacation cabin, you'll be struck by the spacious yard area and beautiful property surrounded by trees. 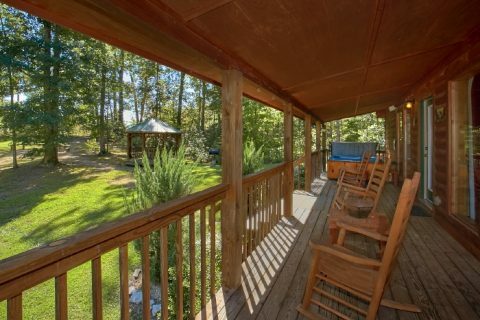 This cabin features a covered wrap-around deck complete with rocking chairs, a porch swing, and a six-person hot tub. 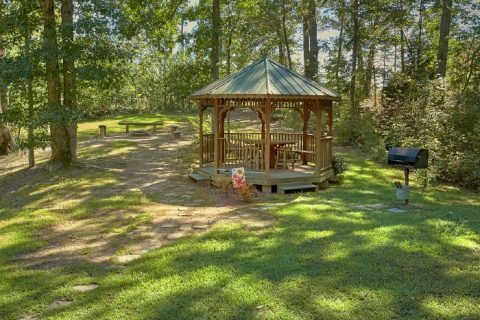 In the yard, you can have fun cookouts under the stars with the charcoal grill near a fire pit, gazebo, and picnic table. 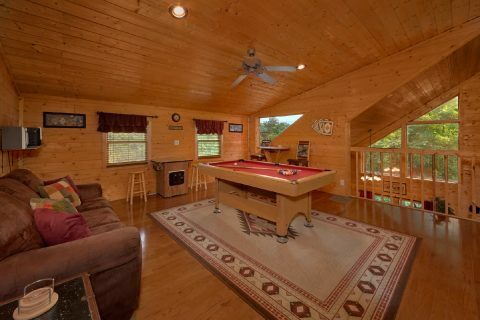 You'll find even more great space to kick back with friends and family inside this cabin. 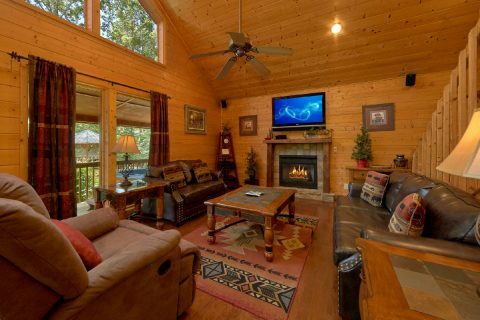 The large living room area boasts cathedral ceilings and large picture windows perfect for enjoying the mountain scenery. 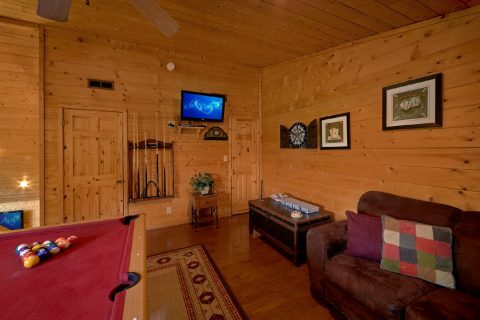 A 42" HDTV with surround sound and a DVD player sits above the lovely custom fireplace near comfy leather furnishings. 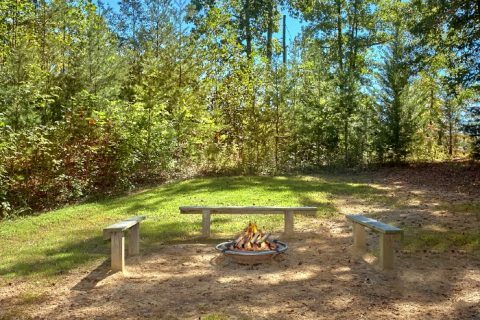 The seasonal gas fireplace makes this a perfect space for watching a good movie with friends and family. 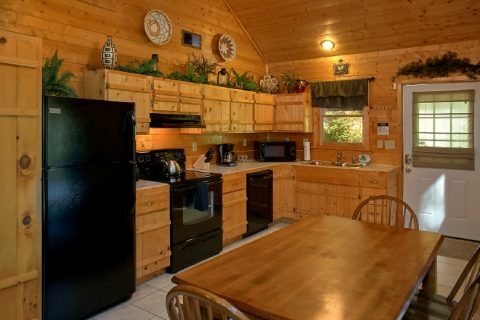 In the nearby kitchen, you'll find everything you need to make tasty meals in your rental in the mountains. 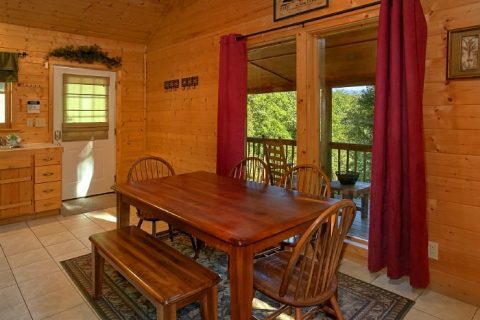 The dining area offers a table with seating for six guests – perfect for enjoying a nice dinner with your family. 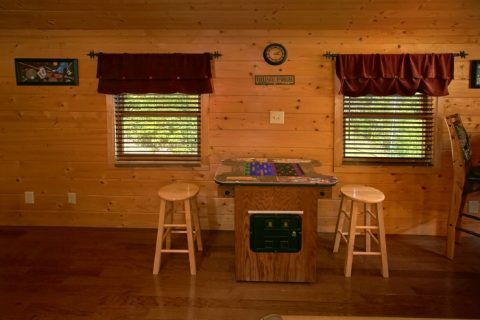 Upstairs, you'll find the lofted game room complete with a pool table, electronic dart board, television, and 39 classic arcade games on a sit-down game console. 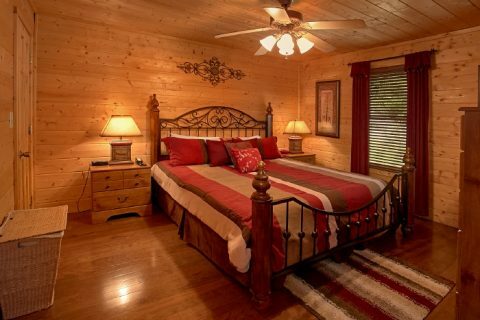 Your cabin boasts two king size bedrooms on this level complete with private bathrooms and televisions. 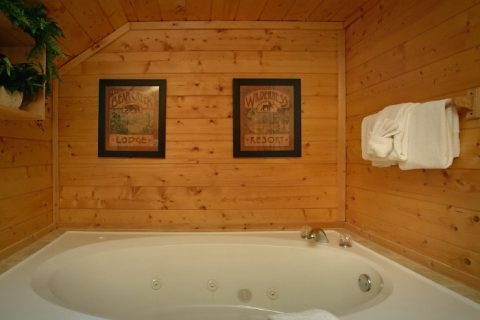 The master suite even boasts a two-person jacuzzi for relaxing in private. 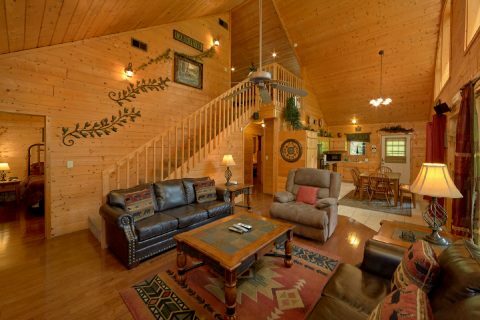 A sleeper sofa in the living area offers comfortable sleeping space for more guests. 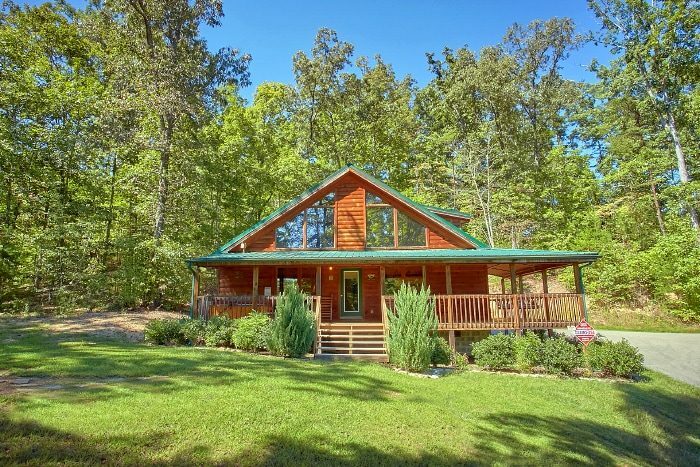 On top of fun and relaxing amenities, this luxury cabin is less than half a mile from a river. 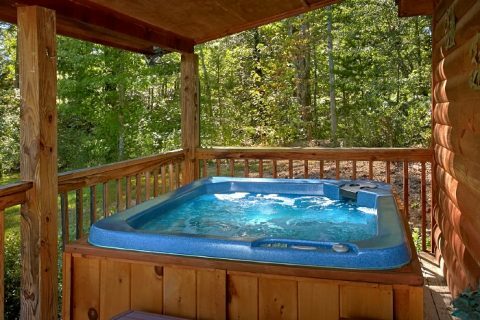 Enjoy summertime swimming or fishing in the pure waters of this mountain stream! 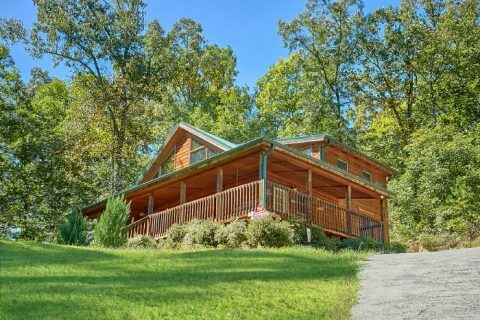 Book your 2 bedroom Richardson Cove cabin in Pigeon Forge today and save 15% with our online discount!